New part for the home lab: access server. My new equipment arrived before the weekend, but I didn’t notice until Christmas because my girlfriend wrapped it up again and put it as a present under the tree. She’s devious at that. So what is it? Something I wanted for a long time: an access server. It consists of a 2611XM router, a NM-16A module, two octal cables and a console cable. The whole setup allows me to connect out-of-band to 16 other Cisco devices, so I will not have to plug console cables around ever again. How? Well, I could make a blog post about this, but it’s already explained quite perfectly here by David Davis. I’ve been negotiating a long time for this (since mid-November), and was able to go under a third of the eBay listed prices for the separate components, so I’m very happy. I can now continue my studies. Speaking of studies: my next study will be CCDA. I’m facing some uncertainties in my life right now and CCDA seems a more realistic short-term goal compared to CCIE. Not that I have abandoned the quest for Internetwork Expert, but the months to come may not give me enough time to properly study such a big project. Either way, CCDA continues the path, and I’ll be using my home lab to further refine my current CCNP skills. Still moving forward. On popular demand: my home lab. Yes, finally some pictures. Everybody kept asking me what my home lab looks like. I’m quite happy about it but it’s not perfect, so if you want to set your own lab, use my guide instead. The first picture shows four 2611 routers and one Cisco Catalyst 2900XL in my rack. 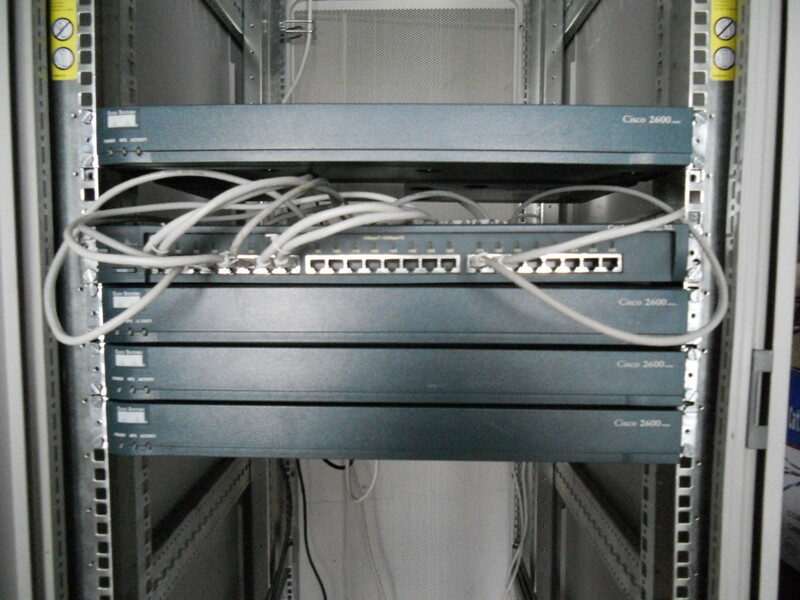 The 2611s have two 10 Mbps Ethernet interfaces, one (unused) ISDN interface and one DB60 serial interface. The 2611s run IOS version 12.3 IP Basic, which is the biggest IOS they can hold on their 8 MB flash. Which means support for RIP, OSPF, EIGRP, Frame Relay, NAT, Tunneling, HRSP, VRRP, GLBP, ACLs… But no IPv6. The 2900XL is ancient: it has twenty-four 100 Mbps ports but runs an unofficial IOS version which just has basic spanning-tree, VLANs and a static port-channel. I tend to use it as a patch panel between the routers mostly. The second picture shows my server on the bottom of the rack. It’s quite heavy and I don’t have a rack-mount kit. It’s an IBM xSeries 335 server: two 32-bits Xeon single cores clocked at 3.06 Ghz, 1.5 GB RAM, two SAS 36 GB 10k rpm hard drives (with hardware RAID support) and two 1 Gbps Ethernet interfaces. It used to run ESX with some virtualized Linux and Windows servers, but now it has become an Ubuntu with GNS3. 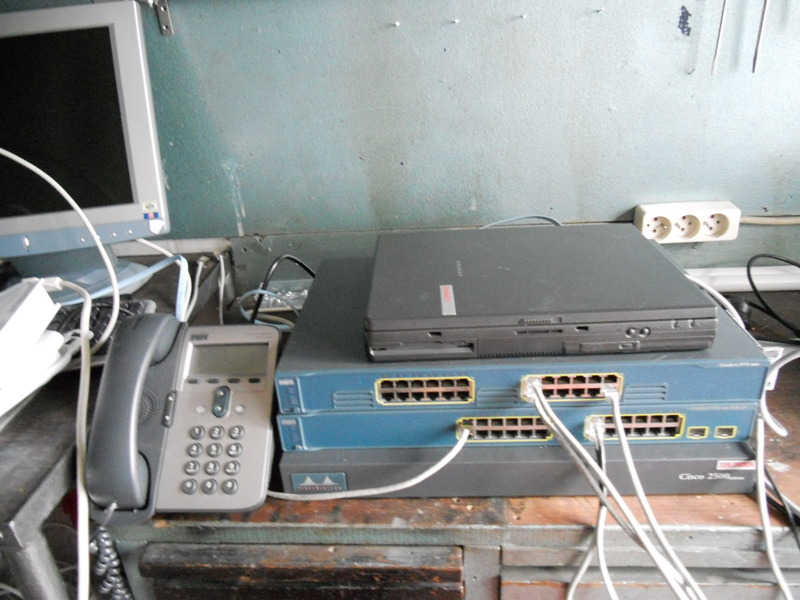 The third picture shows my laptop, an IP Phone, a Catalyst 2970, a Catalyst 3560 PoE and a 2503 router. The laptop is a Pentium III 400 Mhz with a broken battery, no working USB port and no working wifi. But it has a COM port and provides console access without problem, as well as Wireshark and Putty for test through the 100 Mbps NIC. The IP Phone is a Cisco 7912, powered by PoE. I have three of these now. The WS-C2970-24T-E switch is my workhorse for heavy loads: twenty-four 1 Gbps ports with a 24 Gbps backbone, so it can support a full load at all ports at once. It’s IOS version 12.2, with support for MST, PVST, Rapid-PVST, LACP, PAgP, static port-aggregation, VLANs, VTP and security features like port security, DHCP Snooping, DAI and the like. The WS-C3560-24P-S is a full layer 3 switch with twenty-four 100 Mbps ports and two 1 Gbps Small Form-Factor Pluggable Transceiver (SFP) ports. The 100 Mbps ports have Power over Ethernet (PoE) auto-detect. It has a more recent IOS 12.4 IP Services with crypto installed. At the time of writing, it’s still in production and supports all features of the 2970 plus layer 3 functionality like routing protocols, DHCP, IPv6, ACLs, and also QoS and Private VLANs. It even has a temperature sensor and auto-MDIX. The 2503 router is the only survivor of a batch of five 2503s, which was my original CCNA home lab together with the 2900XL. It’s ancient, has two serial interfaces and one 10 Mbps Ethernet interface (with an AUI). It supports routing protocols in their basic configuration, NAT, ACLs. In reality, it reaches about 4 Mbps throughput in my lab, making it the only device I have with less throughput in Mbps than power consumption in Watts. Not photographed: a WS-C3560-8PC-S. It’s an 8-ports 100 Mbps switch with a 1 Gbps uplink. Fanless, completely silent, but all functions of the 24-ports 3560, including PoE. With CCNP SWITCH passed now I can focus on networking in general again now, instead of pure layer 2 stuff. I decided this would be a good moment to reconfigure my server. 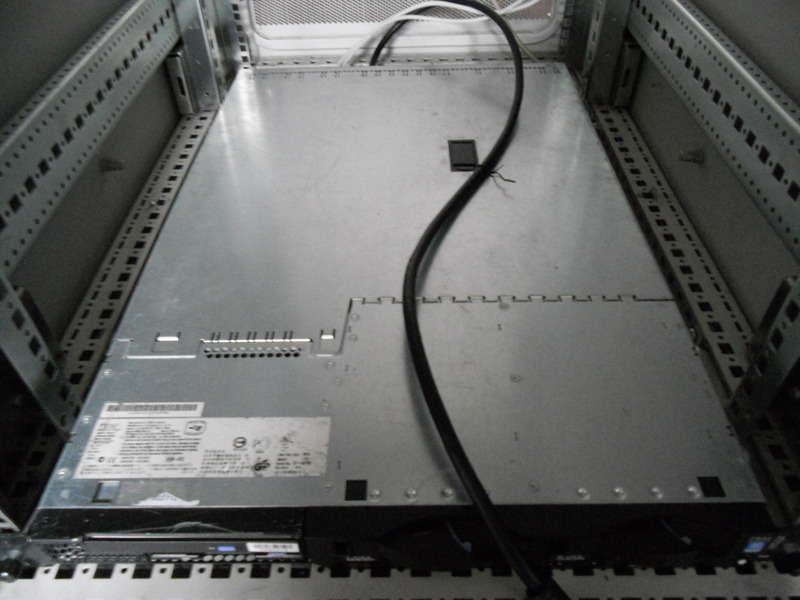 When I was gathering materials for my home lab, I had to chance to pick up an IBM xSeries 335 server very cheap. Since it comes with two gigabit NICs and I had never worked with a rack server before, I decided to go for it. I originally installed ESX 3.5, allowing me to research virtual switching and basics of iSCSI, as well as run Windows Server and Red Hat on top of it. Since I’m familiar with these topics now and not need them directly for my further studies, I decided to install a Linux on it now, and run Dynagen to emulate Cisco routers. Hard decision for me, as I have to admit that I’ve tried a lot with Linux in the past but never could find myself comfortable with it. I downloaded Ubuntu since this would be a relatively user-friendly choice. Strangely enough for me, things worked out quite well so far: I installed Ubuntu, configured some network settings, installed OpenSSH server and Dynagen, and after about an hour I could log in remotely using SSH and get into Dynagen. I couldn’t do anything in it yet as I need IOS images on the Ubuntu, which I will transfer in the next days, and I’m going to have to read through the Dynagen tutorial, as well as figuring out how to easily create and edit the .net files it uses. But all in all again a small step towards more labbing options. New switch for home lab. I picked up my new switch yesterday, for my home lab. It’s a WS-C2970G-24T-E, and will be replacing the old Catalyst 2900 XL in my lab. I was able to bargain the price well below average eBay listings. On top of that, it’s a full gigabit switch, so I’ll be using it for my home network and/or LAN parties as well. I’m also happy to see it supports a lot more commands compared to the 2900XL, which did not support MST, QoS, and had only limited Etherchannel capabilities, for example. I’m now completely set to test out everything I need for the CCNP SWITCH exam. I already passed ROUTE, which should boost my confidence, but apart from that it also reminded me that this is not a walk in the park, so I need to be prepared. I hope to take the SWITCH exam in about six weeks. After that, I only have to face the TSHOOT exam and I’m CCNP certified. For now my lab meets the requirements, but if I ever really go for CCIE, I’ll need to upgrade the routers, as they don’t have enough memory to support everything I need. They’re 2611’s, but no XM’s. I’m still figuring out if I’ll replace them, just buy an extra router with more memory, or if it’s possible to upgrade their flash and RAM. Either way, it’s not needed soon.